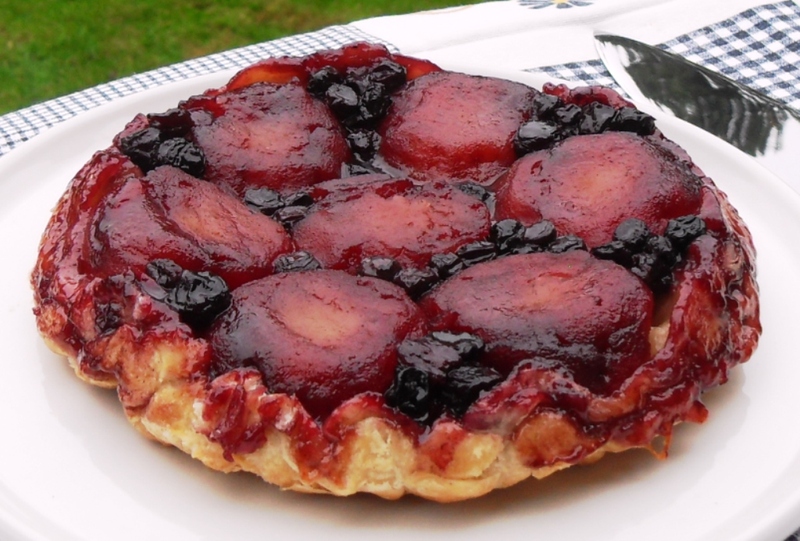 Today I’m bringing you my Apple & Blueberry Tarte Tatin! The first time I made a Tarte Tatin was a rather laughable affair. I’d seen recipe for a French Onion one in a magazine and decided I had to make it. I forgot that I didn’t really have a suitable tin/frying pan and ended up using the only oven proof pan I had which was about 25cm tall! Turning the Tarte Tatin out was like trying to upturn a Sumo wrestler on his head, an experience that was difficult for me and no doubt traumatic for the Tarte Tatin. So when I was offered to try out the Mermaid Hard Anodised Tarte Tatin Tin I was just a tad excited to say the least. It’s a really sturdy tin that goes on the hob, won’t flake, peel, warp or twist and can withstand oven temperatures up to 250°C. It even comes with a life time guarantee! In my haste to bake I just washed it and went ahead without realising that it benefited from seasoning! But I needn’t have worried because it only stuck in 3 tiny places and I realised a wipe around the edge with some oil would probably have been a good idea! I like the fact that there is no handle to this tin because I can’t tell you how many times I’ve burnt my fingers on my casserole pan’s handles. Here you are forced to use your oven gloves so I think it is far safer. The idea for an Apple & Blueberry Tarte Tatin came to me as I wanted my apples in halves and for something pretty and tasty to fill in the gaps. I drew further inspiration from researching other recipes to come up with what I think is a simple and not too unhealthy dessert. 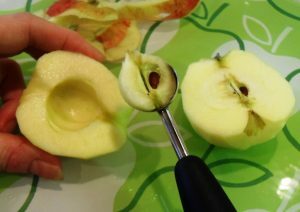 In order to keep my apple halves as in tact as possible instead of an apple corer I used the Oxo Good Grips Melon Baller which was perfect for scooping out the apple core with its smaller scoop. As this was only my second attempt at making a Tarte Tatin, I was very pleased with the result for both the even baking and the ease of use of the tin (oh and it was delicious). I will definitely be making these on a regular basis from now on and experimenting with other sweet and savoury combinations! 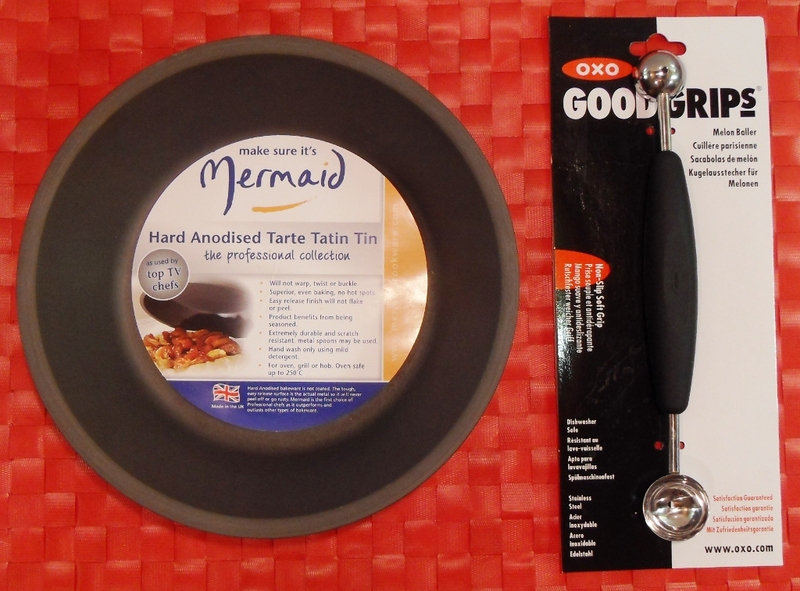 For your chance to win one of 2 sets of a Mermaid Tarte Tatin Tin and an Oxo Good Grips Melon Baller please go to the Rafflecopter at the end of this post. 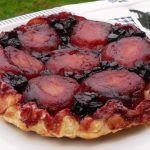 I am entering my Apple & Blueberry Tarte Tatin into Blue Kitchen Bakes’ “Classic French” challenge this month as well as Fabulicious Food’s “Simple and in Season” challenge which is being hosted by Franglais Kitchen this month. Peel, halve and scoop out core of apples. 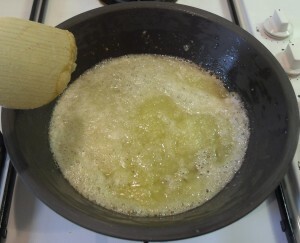 Melt the butter then add the sugar. Cook gently for 1 minute until beginning to caramelise. Coat the apples in the caramel and cook gently for 10 minutes. Take off the heat and add the blueberries and vanilla sugar. 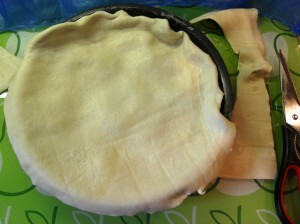 Lay the pastry on top and trim leaving 2cm excess to tuck in. Once pastry in completey tucked in cook in oven for 25 minutes. Take out when pastry is golden all over. Enjoy with a good dollop of ice cream! 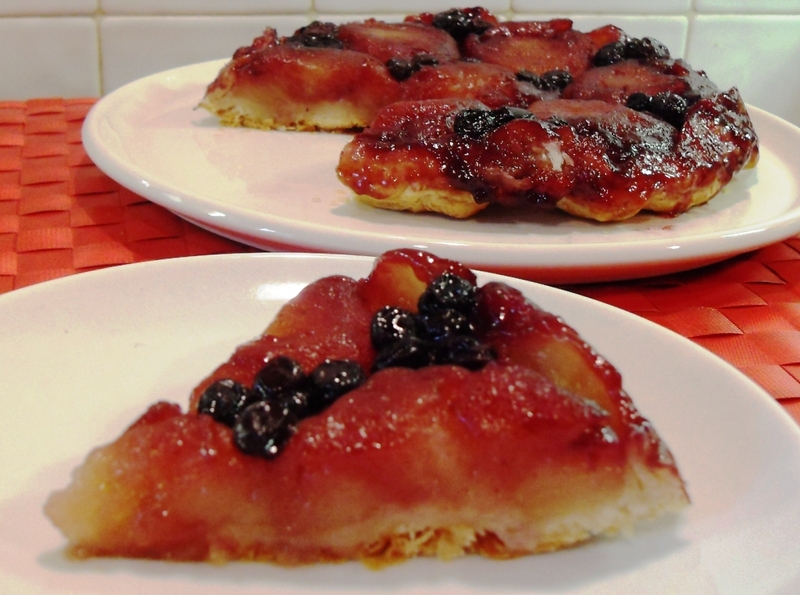 Apples and blueberries are caramelised with a hint of vanilla in this delicious Tarte Tatin. Peel the apples and then cut in half. Scoop out the core (a melon baller is useful here) and carefully cut away stem and base to leave as near perfect a half moon shape as possible. 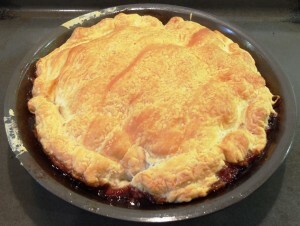 Melt the butter in a 20cm / 8” Tarte Tatin tin (or an oven proof frying pan) over a medium heat. 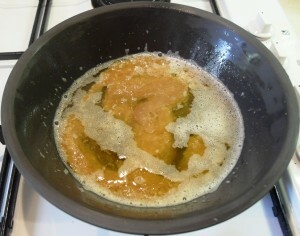 Lower the heat and stir in the sugar until it starts to caramelise (about a minute). 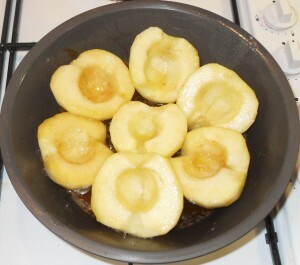 Add the halved apples and cook gently for 10 minutes turning the apples to coat them in the caramel butter. 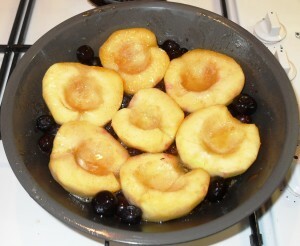 Remove the tin from the heat and with the apples cut side up, slot the blueberries in amongst the gaps. Sprinkle 1tsp vanilla sugar over the apples. Now unroll the puff pastry and prick all over with a fork. 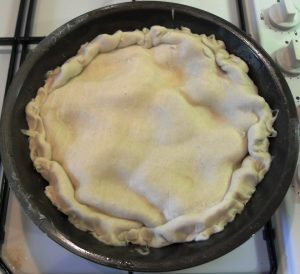 Lay the pastry over the apples and trim with scissors leaving a 2cm excess. Tuck the excess pasty in over the apples. Cook on the middle shelf of oven for 25 minutes until the pastry is golden brown. Place a serving platter on top and invert to serve, carefully removing tin. For your chance to win one of 2 sets like above simply fill in the Rafflecopter below. 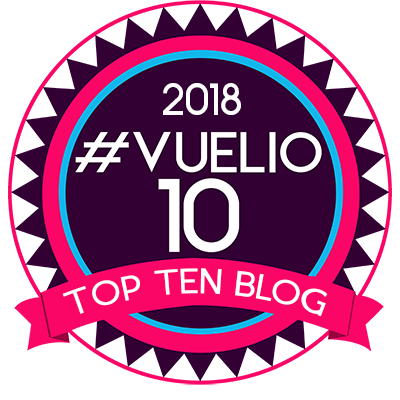 Complete the Rafflecopter form above to confirm your entries made via blog comments, Twitter, etc. This giveaway will close on 27/11/2012. Do you want more chances to win? Come back daily after tweeting about the giveaway and fill the form in again. Only open to UK participants over the age of 18. There are 2 prizes worth in excess £28 each. There’s no cash alternative and the prize is not transferable. No part or parts of the prize may be substituted for other benefits, items or additions. Instructions form part of the terms and conditions. Entries using any software or automated process to make bulk entries will obviously be disqualified. The winner will be picked at random using software and then contacted by email. If you win and then don’t respond to this email within 7 days then another winner will be picked. The prize will be delivered to the winner as soon as possible after you have e-mailed your delivery address. I am running this giveaway on behalf of George Wilkinson and Oxo UK who will be responsible for sending the prize to you if you win. Their decision is final and binding and no correspondence will be entered into. 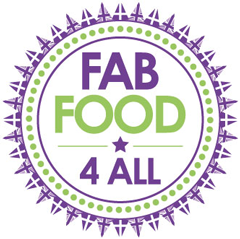 NB: The Mermaid Tarte Tatin Tin and Oxo Melon Baller were given to me to use in my recipes, no payment was received and all opinions are my own. Oo, I have a few apples ready. Apple & cinnamon mmmmm my Nan would love this too ! Pity I’m the only one in the house who likes these flavours ! If only those we lived with shared our tastes! I keep wanting to know how to make this, after seeing them do so many on Masterchef. 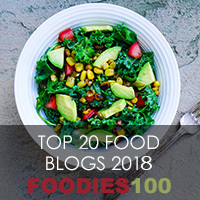 Thank you for the recipe – and yours looks better than most of the Masterchef ones too. Wow that looks good! Definitely going to try this next year when our blueberries are ready! Great stuff. Keep the apple recipes coming. looks awesome. I am going to dry this using coconut oil and transform some brown sugar into caster brown. I think I’d probably make pineapple tarte tatin, though I have to admit the apple and blueberry one that you made looks delicious.